The ESSCO-MGH Breast Cancer Research Fund » Blog Archive » Exciting October Fundraising Event! Save the date of Friday, October 16, 2015 for our 20th Anniversary Gala! This special evening will be held at the Pine Brook Country Club in Weston, MA, where we will honor our long-time supporter, William F. Leisman, III. More information will follow. Don’t miss this wonderful event! 100% of every penny raised goes directly to cutting-edge research at the Massachusetts General Hospital in Boston, MA! 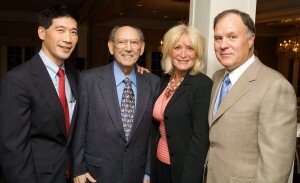 Ken Tanabe, Albert Cohen, Susan Wornick and Bill Leisman at the 2006 annual benefit. This entry was posted on Thursday, July 31st, 2008 at 2:50 pm	and is filed under ESSCO-MGH. You can follow any responses to this entry through the RSS 2.0 feed. You can trackback from your own site.